"The music is different here. The vibrations are different here." So opens the 1972 Afrofuturist sci-fi film Space Is the Place by jazz cult-icon Sun Ra. But these words could also apply to (le) poisson rouge, the Bleecker Street club known for its diverse, open-minded programming. 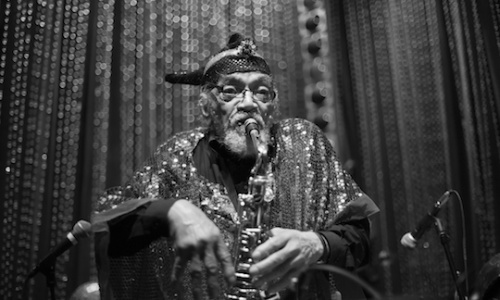 This cosmic evening, part of LPR’s 10th-anniversary celebrations, builds up to the Sun Ra Arkestra’s live performance of the score to the film, in which Black people create their own paradise on Saturn, transported there by music. Getting us to that place tonight are the beloved songs of Bill Withers (“Ain’t No Sunshine When She’s Gone,” “Just the Two of Us”) performed by Blue Note jazz and R&B artist José James. Jazz pianist and composer Samora Pinderhughes opens with The Transformations Suite, a musical examination of the radical history of resistance within communities of the African diaspora.